In March 2019, the 2nd edition of the course "The European Union and Human Rights (2nd ed 2018-2019)" will be held. Registration fee: 10 euros. Pre-registration for the course will be open throughout the month of February 2019, and can be done at the following link, selecting the corresponding course. Then, the student will receive an informative email confirming their registration, with a link to the payment receipt and the instructions to access UACloud. From January 7 to 31, 2019 the registration period for the 2nd edition of the course "The EU: Organization and Functioning, a Spanish perspective" will be open. It is a free course, recognized by the Institute of Education Sciences (ICE) of the University of Alicante: validated for "ICE hours". Teachers of Secondary Education. University graduates who have completed or are studying the Master's Programme in Secondary School Teaching. University graduates from any other field and those who want to know more about the European Union. Timetable: 4:30 p.m. to 7:30 p.m. Course "Immigration, Human Rights and border control in the E U"
The pre-registration and enrollment period for the course " Immigration, Human Rights and border control in the European Union” to be given in February-March 2019, is now open. The registration fee is 10 euros. If you are interested, sign up as soon as possible, as the places are limited. You can pre-register in the following link, selecting the corresponding course. Then, after receiving an email confirming your registration, you must enroll in the course through UAcloud, following the instructions. Conference "The European Union and Spain in the face of the international law of investments"
In 12th to 15th of November" are held the "European Union and Spain in the face of the international investment law", organized by the Interuniversity Centre for European Studies (CIEE) of the University of Alicante subsidized by the Programme for the promotion of scientific research, technological development and innovation in the Valencian Community. See further information on the event by clicking on the news item link. The next 5th and 6th of November will take place the International Congress entitled Reflections on the role of the European Union and its Member States in the migration crisis of recent years. The Congress is organized by the Public International Law and International Relations Department of the Miguel Hernández University with funding from the Ministry of Education, Research, Culture and Sports of the Generalitat Valenciana. "8th Course on Security and Defence", which this time will be focused on "The participation of the Spanish Military Forces in international missions". The admission to the activity, to be held at the Conference Hall (Salón de Grados) at the Faculty of Law from 11.00 a.m. to 2.p.m., is completely free but limited to seating capacity. Certificates of attendance for those attendees who having participated in the entire activity will be issued on request. Now you can register in the "EU: Organization and Functioning Course" completely free of charge. If you are a Secondary School teacher, or will become one soon, this course is made for you, as it is aimed to facilitate the teaching of the optional subject "The EU: Organization and Functioning" (Order 18/2011, of 1 st April, by the Education Branch of the Valencian Government) to be delivered at the "Bachillerato" stage. If you are a University Graduate in any other field and want to learn more about the European Union, you are more than welcome, because the course provides very useful facts for citizens residing and working within the Union's territory. University graduates that possess the Certificate of Pedagogical Aptitude. University students of the last courses of Degree. If you are interested, hurry up! Registration is on a first-come first-served basis. However, if you are only interested in a particular thematic module, you are more than welcome too, since the course is offered in conference format. In this case, entrance will be limited to seating capacity. The pre-registration and enrollment period for the course "The European Union and Human Rights (1st ed. 2018-2019)" to be given in October 2018, is now open. The registration fee is 10 euros. If you are interested, sign up as soon as possible, since the places are limited. You can pre-register in the following link, selecting this course. Then, after receiving an email confirming your registration, you must enroll in the course through UAcloud, following the instructions. Here you can see all the course information. This course can be validated for both former free-choice credits and new degree credits. This course is focused on the analysis of the most important challenges facing the European Union in our days. Especially, the Brexit, the prolonged financial and economic crisis, the migration crisis and the fight against climate change, represent challenges that the European Union has to face, trying to overcome important difficulties in order to offer an answer to each one of them. V Workshop "International Joint Operations Situation of immigration in the Mediterranean"
On 30th, 31st of May and 1st of June 2018 the University of Alicante will host the 5th Workshop on "International joint operations on the situation of immigration in the Mediterranean", organized by the University Institute of Internal Security Research (IUISI). The workshop will present the current situation of joint operations, how they are managed, their development and the desirable evaluation of these in the future. Also, there it will be explained how the Civil Guard contributes to create the NSP (National Situational Picture) of Spain in relation to joint operations in the international arena, the different possible scenarios that we face during these and the strategy that they protect. Venue: Ramón Martín Mateo Rector Hall, Faculty of Law, University of Alicante. In addition to participating in the entire workshop, it is possible to attend the papers that are of most interest (program attached). III Conference "Western Sahara and Valencian Public Universities"
On Wednesday, April 25, 2018, the Director of the CIEE, Prof. Jaume Ferrer Lloret, will participate in the roundtable "Reflections on the current situation of the peace process in Western Sahara", within the III Conference on Western Sahara and the Valencian Public Universities, organized by the Secretariat for Internalization and Cooperation and the Vicerectorate of International Relations of the University of Alicante. Venue: Rectorado Multimedia Room. - Campus of San Vicente del Raspeig - University of Alicante. Free entrance , limited room capacity. Series of round tables "Studies on the EU in Secondary Education: specific areas"
The Interuniversity Centre for European Studies of the University of Alicante, with the co-financing of the Erasmus + Jean Monnet Activities Program-EAC / A03 / 2016 (586888-EPP-I-2017-I-ES-EPPJMO-PROJECT) organizes the days 1, 8.7 and 14 fo March 2018 a series of round tables on studies of the European Union in Secondary Education. Upcoming course "EU: Organization and Functioning " course, free of charge. If you are a Secondary School teacher, or will become one soon, this course is made for you, as it is aimed to facilitate the teaching of the optional subject "The EU: Organization and Functioning" (Order 18/2011, of 1 st April , by the Education Branch of the Valencian Government) to be delivered at the "Bachillerato" stage. University students of the last courses of any Degree. If you are interested, hurry up! Registration is on a first-come first-served basis. However, if you are only interested in a particular thematic module, you are more than welcome too, since this year the course is offered in conference format. In this case, entrance will be limited to seating capacity. The course "The European Union and Human Rights (2nd ed. 2017-2018) will be taught in February-March 2018. This academic year the registration fee is 10 euros. If you are interested, sign up as soon as possible, as the places are limited. You can pre-register in the following link, selecting the corresponding course, open from 8th January to 16 February 2018. Then, after receiving an email confirming your registration, you must enroll in the course through UAcloud, following the instructions. The professors of the CIEE will teach from 5 December 2017 to 6 February 2018, the subject "The European Union in the face of the big political and economic crises: the migratory and financial crises and the Brexit", included in the plan of studies of the diploma senior 2017/18 of the Permanent University of the University of Alicante. The Permanent University of the University of Alicante (UPUA) is a program of scientific, cultural and social development of the University aimed at promoting Science and Culture, at the same time as intergenerational relations, to improve the quality of life of the elderly and encourage their participation, in their context, as social driving forces. Within the framework of the UPUA program, in collaboration with the Ministry of Education, Research, Culture and Sports and various municipal bodies and private banking entities, university training for seniors is offered in order to respond to the interests and needs of this sector of the population of the Valencian Community. 1. An introduction to the basic operation of the EU. His institutional system. 2. The uncertainties on the extensions and exits of the European Union. The Brexit. 3. The financial and economic crisis in the European Union. The construction of the Banking Union. 4. The European Union in the face of the international migratory crisis: repercussions for Spain. 5. The European Union in the face of the big global challenges. Especially, the Union and the climatic change. Sixth Edition of ELSA DAY: " Justice beyond borders"
Next Thursday, November 30, will take place the sixth edition of ELSA DAY (European Law Students' Association), under the theme: "Justice beyond borders." On this occasion, Prof. Ms. Carolina Soler García, Academic Secretary of the Interuniversity Centre for European Studies of the University of Alicante and Professor of Public International Law and International Relations, will participate with ELSA Alicante with a paper entitled: "The rights of foreigners as a limit to state sovereignty in matters of expulsion. " Debate session with the Citizenship. The Future of Europe and of the Cohesion Policy of the European Union. Next Tuesday, November 28, Prof. Dr. D. Jorge Urbaneja Cillán, Researcher of the Interuniversity Centre of European Studies of the University of Alicante and Prof. of the area of International Public Law and International Relations of the University of Alicante, will participate in the Debate session with the citizenship regarding the future of Europe and the cohesion policy of the European Union and other instruments. Hours: from 9:30 a.m. to 2:00 p.m.
On 27 and 28 November, Prof. Dr. Jaume Ferrer Lloret, Jean Monnet Chair of the European Commission and director of the Interuniversity Centre for European Studies of the University of Alicante, and Prof. Dr. Millán Requena Casanova, holder of a Jean Monnet teaching module will attend the Jean Monnet Biennial Conference (BiCo), co-organized by EACEA. The 2017 year's edition of the JM conference will be devoted to the current major political turning point in EU history and its consequences for the future of the European integration. This theme has been very high on the agenda of political and academic debates recently and is about to gain even more relevance in the light of the Commission's White Paper, the speech on the state of the union by president Juncker and also major political developments in EU member states in the course of 2017. This year's conference objective is to allow debate on important EU-policy issues but also to disseminate information on more technical issues for the new grant holders. Now you can register in the "EU: Organization and Functioning " course, free of charge. The CIEE, co-funded by the Ministry of Defence, will hold on 10th and 11th October the "6th Course on Security and Defence", which this time will be focused on "the participation of the Spanish Military Forces in international missions". The admission to the activity, to be held at the Conference Hall at the Faculty of Law (Salón de Grados) from 11.00 a.m. to 2.p.m., is completely free but limited to seating capacity. There will be issued certificates of attendance for those attendees who having participated in the entire activity so request. The pre-registration and enrollment period for the course "The European Union and Human Rights (1st ed. 2017-2018)" to be given in October 2017, is now open. This academic year the registration fee will be 10 euros. 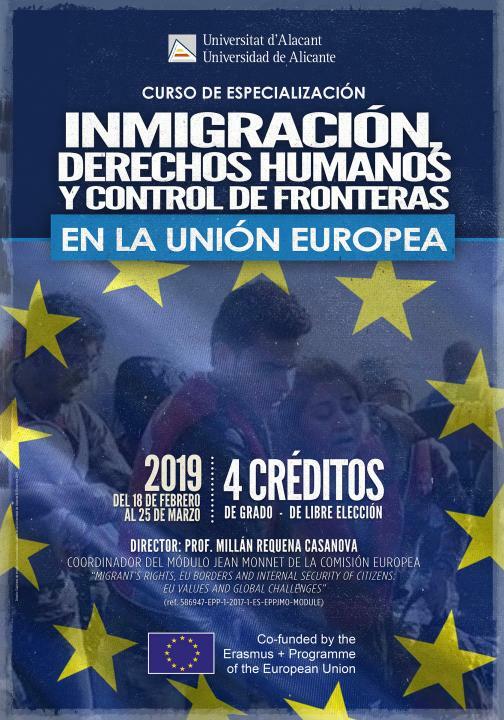 From today until next Thursday, July 13, experts in Law and migration crises meet at the University of Alicante to address the repercussions in Spain of the current international migrant crisis. To this end, the summer course "The European Union in the face of the international migration crisis: repercussions for Spain" has started this morning, with interventions by Antonio Galiano, director of the Secretariat of International Mobility of the UA; and Jaume Ferrer, director of the course and professor of Public International Law and International Relations of the UA. The meeting, sponsored by the Interuniversity Center for European Studies, addresses topics of high interest and topicality such as the impact of armed conflicts on migration in Europe; refugee protection; what is the EU's position on the migration crisis; border management; or expulsions of immigrants. The debates focus on the following areas: the evolution of the international conflicts that have caused the migrant crisis (Syria); the controversial management of the migration crisis by the European Union (agreement with Turkey); and the legislative, administrative and judicial practice of Spain in this respect. Mr. Jaume Ferrer, director of the course, stated that "the response to the serious migration crisis is the full respect for human rights; the increase of material and human resources; the reinforcement of foreign and security policy for the resolution of conflicts, and the implementation of a commercial and development cooperation policy in third world states. " "Altiero Spinelli Prize for Outreach: Spreading Knowledge about Europe"
The European Commission has started on 28/06/2017 an EU-wide contest for the "Altiero Spinelli Prize for Outreach: Spreading Knowledge about Europe". This Prize will reward outstanding contributions that communicate the founding values, history, action and key benefits of the EU to citizens. Eligible participants include, for example, scholars, researchers, scientists, writers, journalists and artists who can contribute to articulating what Europe stands for today and tomorrow. This first-time Prize complements the Jean Monnet Actions – an Erasmus+ funded initiative supporting teaching and academic research programmes on EU studies. This summer course analyses the severe migrant crisis that is currently affecting Europe and the impact it has on Spain in particular. The next topics will be dealt with more thoroughly: the evolution of the international conflicts which have largely originated the migrant crisis (Syria...), EU’s controversial management of the migrant crisis (Deal with Turkey) and Spain's legislative, administrative and judicial actions. "The European Union in the face of Brexit: challenges for Spain"
As part of the activities of the Jean Monnet Module "Equal Treatment and Non-Discrimination Law in the European Union", led by Professor Dr. Millán Requena Casanova, the conference / seminar "The European Union in the face of Brexit: challenges for Spain", will take place next Friday, April 7th. This event will be held in the Courtroom classroom of the Faculty of Law at the UA, from11:00 to 13:00 hrs. - Dr. Carlos Jiménez Piernas. Professor of Public International Law and International Relations at the University of Alcalá. - Dr. Jaume Ferrer Lloret. Professor of Public International Law and International Relations at the University of Alicante. Seminar "Gibraltar: its international and European status at the post-Brexit crossroads"
Mr Antonio García Ferrer, General Deputy director of the Office for Gibraltar Affairs of the Secretary of State for Foreign Affairs and Cooperation of the Ministry of Foreign Affairs, will offer this conference to the students of International Law, which will focus on the main historical and legal elements of the dispute, with particular attention ito its international and European status at the post-Brexit crossroads. The seminar will be presented and moderated by Mr Millán Requena Casanova, Professor of International Public Law and International Relations of the University of Alicante. The act will take place in classroom 8-G of the Faculty of Law of the University of Alicante on Wednesday 15 March at 11:00 hours. Admission free, subject to seating capacity. Certificates for the course "The EU and Human Rights", Feb 2016, now available. Certificates for "The EU and Human Rights" course (Feb-Mar 2016) are now available. Note: from now on the certificates will be in electronic format and have to be downloaded via students' UACloud, in "e-administración>Trámites". First you have to apply for the certificate on the app; secondly, you have to pay for the issuance fee (online); and, finally, you will be able to download the certificate. Please, should you have any queries, do not hesitate to contact us. 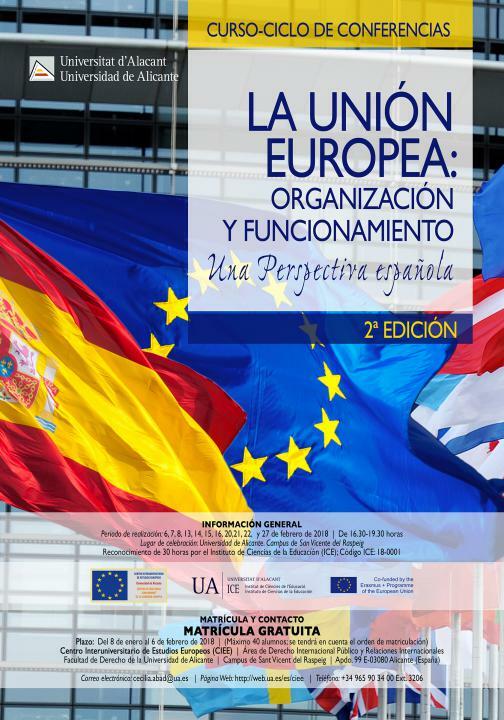 Next Tuesday 21 February 2017, Ms. Daría Terradez Salom, General Director of Relations with the European Unión and the State, will visit the UA and will take part in one of the sessions of the course "The European Union: organisation and operation" (2ª ed. ), organised by the Interuniversity Centre of European Studies of the University of Alicante. In the session Ms. Daría Terradez Salom will talk about the participation of the regions in the European Union, with special reference to the role and actions carried out by the Generalitat Valenciana in this regard. Place and hour: Aulario I, classroom 1-24M, at 16,30h, University of Alicante (Sant Vicent del Raspeig). by calling the Secretary's Office. If you are a University Graduate in any other field and want to learn more about the European Union, you are more than welcome, because the course provides very useful facts for citizens residing and working whithin the Union's territory. The CIEE has just opened its Facebook page, so that you can catch up on its activities through this social network. THE CIEE HAS A TWITTER ACCOUNT AT LAST!